Exciting News for all of you food lovers out there!! National Cheeseburger Day is on Sunday (the 18th) and that means that participating businesses will be featuring their best of the best cheeseburgers and some with a special price. Who can say no to that?! This is a national holiday but we all know that living in the U.S. means you take it extra seriously. That is of course because America is the birthplace of the cheeseburger! You could have probably guessed that one, but did you know that in the states the cheeseburger is the most popular menu item? Yup, more than 50 billion burgers are eaten by Americans every year! That’s a lot of buns and patties. Think about it, in addition to National Cheeseburger Day, many American holidays are centered around excuses for grilling up some yummy cheeseburgers. In honor of this great american tradition and of National Cheeseburger Day, we have compiled a list of the best cheeseburgers joints on the Big Island. Find out how these places are planning to help celebrate the juicy holiday! Enjoy ocean views, local craft brews, and live music at Splasher’s Grill. Located inside of the Seaside Hotel, this hidden spot is a gem! The best part of dining with Splashers? Their gourmet burgers! To celebrate National Cheeseburger Day, Splasher’s is having a special. Order the Guacamole Bacon Pepperjack Burger topped with Chipotle Aiole. YUM! Don’t forget to take advantage of the free parking for all Splasher’s diners and the ability to order and pay for your food online! So whether you are in a rush or just want to skip the wait, you can enjoy a delicious meal. We are doing a special. 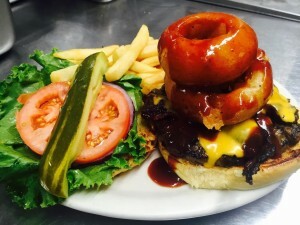 Arrive at Ultimate Burger for the “ultimate” treat! This casual burger spot serves fries made from scratch and uses the finest local ingredients in all of their dishes. Food is the focus for this place, and since they stick to burger and fries you can rest easy knowing that they have perfected their recipes. This low key burger place is known for its massive piled-high burgers and exceptional service. For all those vegetarians looking to join in on National Cheeseburger Day, this is the place for you! Order the Veggie burger and you won’t be sorry you did. You know what goes great with any meal? A Bloody Mary from Cronies! THEY ARE DELICIOUS! 0 comment(s) so far on National Cheeseburger Day!